I meant to go and paint today, but my friend wanted to have a game, so I ended up having a match with him today. I did manage to finish painting my Storm Troopers after the game, and most of my Skitarii, Guardsmen and all my Storm Troopers (including Commissars) are painted. The only models I have left are my Leman Russ tanks and Armored Sentinels, plus 15 completely unpainted Guardsmen, a Leman Russ Annihilator and a few completely unpainted Skitarii. I hope I'll be able to finish painting them tomorrow, or at least sometime next week. Once I'm done with that, I'll proceed to get my Armiger Helverins sometime next week. Original list, until my opponent said, "please no super-heavies." Poor Shadowsword. Anyway, the game today was 2,708 points...because my opponent wanted to squeeze in his Sicarian Battle Tank. Or something. He brought a Space Wolves Brigade, so Logan in Terminator armor, an Iron Priest, Lukas the Trickster, some other HQ unit (I can't remember, seems like a Wolf Priest or something), Terminators with storm shield and thunder hammers, Wulfen with storm shields and axes or something, 5 Intercessor squads, a single Blood Claws squad with Terminator Wolfguard in it, 2 squads of Inceptors, Thunderwolf Cavalry of 3 dudes on wolves, Longfangs, a Land Raider Crusader and the Sicarian Battle Tank. So scary. My Guardsmen probably wanted to run away and hide under the table instead of facing such ferocious melee combatants. Gosh, and I remember how the Space Wolves utterly ripped apart the poor Prosperine Spireguard in both A Thousand Sons and The War of the Fang. Ugh. This is gonna be brutal. 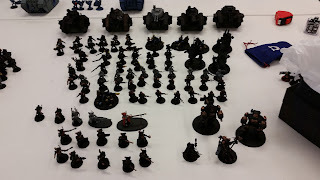 On the other side, I brought an Imperial Guard Brigade of my own, a Spearhead Detachment and a Skitarii Battalion. 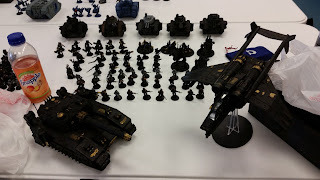 Originally I was going to bring a Shadowsword and Valkyrie, but my opponent wasn't very enthusiastic about playing against a super-heavy, so I swapped out my Shadowsword and Valkyrie for Skitarii. In my Brigade, I had 3 Tempestors Prime, 3 Tempestus command squads with 4 plasma guns each, 2 Tempestus squads with 2 plasma guns each, a Tempestus squad with 2 meltaguns and 3 infantry squads with 1 plasma gun each, 2 Armored Sentinels with lascannon, 1 Armored Sentinel with plasma cannon, a heavy weapons squad with 3 lascannons and 2 Leman Russ Annihilators. The Spearhead Detachment had a Company Commander and 3 Leman Russ Executioners. The Skitarii Battalion had a Tech-priest Dominus, a Tech-priest Enginseer, a squad of Skitarii Rangers with 2 transuranic arquebuses and omnispex, 2 squads of Skitarii Vanguard with 2 plasma calivers and omnispex each, and 2 Kastelan robots with 3 heavy phosphor blasters each. Heh. Basically the Space Wolves had fallen to Khorne's influence and are going berserk, so they attacked the Adeptus Mechanicus research installation, and the Skitarii and their Astra Militarum allies have been enlisted to fight against the rampaging Khorne-fallen Space Wolves. Or something. At least that was the narrative we came up with, anyway. So my opponent has 15 Command Points and I have 21 Command Points. This is just hilarious. This is why I play Imperial Guard...not that we have any awesome Stratagems to spend all those Command Points on anyway. Wait, that's what the Draconis IV (basically Mars) Skitarii Battalion is for. To spam the Wrath of Mars Stratagem. Yay. The core of my army. 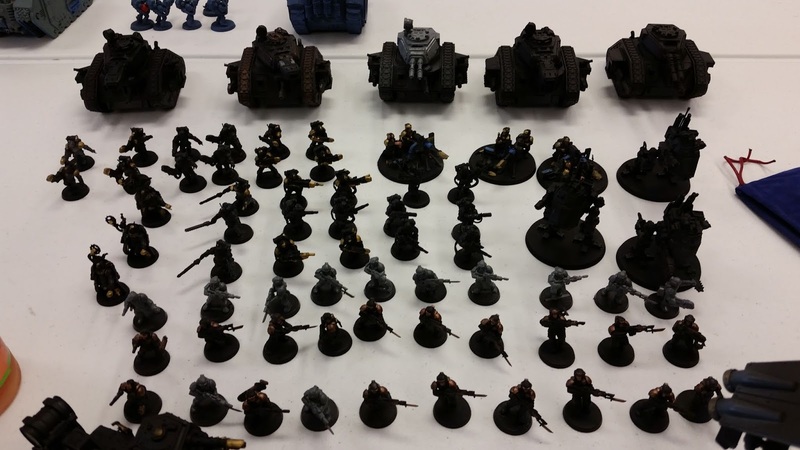 Infantry, Storm Troopers, Armored Sentinels and 5 Leman Russ tanks. Anyway...where were we? Right. My opponent went first, rolling a 6 and getting a +1 to his roll since he has a lot less units than I did. I rolled for my Canticles and had the re-rolls of ones for both fight phase and shooting phase. He moved his Sicarian Battle Tank a little forward, and had most of his Intercessors and his Blood Claws Advanced. Only 2 squads of Intercessors moved normally. The Land Raider Crusader moved and Advanced for some reason. Probably to unload its cargo of Wulfen as close to my frontlines as possible. Ugh. The Sicarian Battle tank unloaded its main weapon - some accelerator that was 8 shots Strength 7 AP -1 but becomes AP -3 if you get a wound roll of 6 - onto one of my Leman Russ tank (Annihilator) and did a total of...2 damage. Its lascannons did more wounds, which was 8 and brought my Leman Russ Executioner down to 4 wounds. The Longfangs also fired and did another 5 damage to my Leman Russ Annihilator, bringing him down to 5 wounds. That sucked. The Intercessors who didn't advanced fired and shaved off 5 of my poor Guardsmen in the center squad. Another Intercessor squad fired, and for some reason he decided to fire into my Armored Sentinel, taking off 2 wounds if I'm not misaken. I don't think anyone else fired anything...if I'm not mistaken, I managed to pass morale for the 5 Guardsmen, just barely, by rolling a 2. Phew! Then it was my turn and I retaliated. Before that, I had my Tech-priest Enginseer move up and repair my wounded Leman Russ Executioner tank, and used Tech Adept Stratagem to repair twice. Thanks to that, he now had 8 wounds instead of 4. Yay! Between 2 Armored Sentinels with lascannons, the Leman Russ Annihilator and Leman Russ Executioner, I wrecked the Sicarian Main Battle Tank. Woohoo! My Leman Russ Annihilator killed about 4 Intercessors with his plasma cannon sponsons. On the other side of the table, my heavy weapons squad fluffed their shots and missed most of them despite having re-rolls to hit due to the Take Aim! Order and them following the Cadian Regimental Doctrine. It was up to my other 3 Leman Russ tanks to fire all their lascannons into it, which brought it down to just 3 wounds remaining. The Leman Russ Executioners fired their plasma cannons into the Intercessors, though, which wiped out another 2 squads. I think my Guardsmen also fired and killed another 4 Intercessors, so there were 2 squads left with 1 Sergeant each. Killing the Sicarian Battle Tank gave me First Blood, by the way. The Skitarii Rangers fired their transuranic arquebus and killed a single Longfang. I almost forgot about my Kastelan Robots, and I had them fire into the Blood Claws, with the mortal wounds from Wrath of Mars killing the Wolfguard and the rest getting wiped out by the normal Heavy Phosphor Blaster rounds. Then one of the Sergeants fled due to morale, but the other passed because of They Shall Know No Fear, which meant he only had one Intercessor squad, one Sergeant, the Longfangs and the Land Raider Crusader left on the table. On the other hand, he failed to kill even one of my units. No Shadowsword allowed? Okay, let's bring in the Skitarii and Legio Cybernetica. Turn 2 began and this is where the real fun begins. This time, I had Shroudpsalm, not that it matters because he didn't shoot at any of my Mechanicus units. The other one was re-roll failed morale tests for Adeptus Mechanicus units. Ditto. Anyway, he disembarked his Iron Priest, Wolf Priest, Lukas and Wulfen from his wounded Land Raider Crusader and had the Iron Priest repair 3 wounds on his Land Raider Crusader (he actually used a Command Re-roll for that, having rolled a 1 at first, and I stole his Command Point with Kurov's Aquila). He then Deep Struck his 2 squads of Inceptors in front of one unit of Guardsmen and the tanks they were protecting, infiltrated the Thunderwolf Cavalry right behind the Inceptors, and his Terminator squad and Logan in front of my wounded 5-men Guardsmen squad. The Wulfen were bearing down on my Guardsmen squad on the far right. His Longfangs put another 4 wounds on my Leman Russ Annihilator, bringing him down to 1, while his surviving Intercessors killed 1 Guardsmen from the wounded squad. I can't remember what he did, but one of his units fired on my Leman Russ Annihilator and blew him up after taking out his last wound. I can't remember who did it, it might be the Land Raider Crusader and his hurricane holters or heavy bolters. I do know the Land Raider Crusader fired its storm bolter and assault cannon into my Armored Sentinel of all things, dealing him another 2 wounds - the poor Sentinel was left with just 2 wounds. But he did his job well, distracting the firepower of my opponent away from my tanks. Speaking of that, instead of firing into my Guardsmen, the Inceptors fired all their assault bolters into my Leman Russ Executioner and did a total of 2 wounds. Uh...okay. Why in Holy Terra would you do that? Apparently he was confident of making his charge and having his Inceptors destroy my Guardsmen in combat. Alas, it was not to be. The charge phase was brutal, as I would expect. Funnily enough, both Inceptor squads failed their charge, despite charging into one Armored Sentinel and my unscathed Guardsmen squad respectively. My Guardsmen even managed to put a single wound on an Inceptor through overwatch - he failed his 3+ armor save and ate a lasgun shot. For nothing. In the middle, Logan charged and ate a plasma gun shot to the face. He failed his charge, unfortunately and took 2 wounds. Hah! Serve you right! The Terminators or Wolf Guard with him, however, made their charge and my plasma gunner who put the 2 wounds on Logan killed himself with his supercharged plasma gun. Oh well, no matter. I mean, he would have died in melee against the Wolf Guard and their thunder hammers anyway. On the other side, the Wulfen made their charge without taking a single wound, and they utterly wiped out the 10-men infantry squad camping there. The 4 surviving Guardsmen were also hammered to death by the Wolf Guard, and both the Wulfen and Wolf Guard consolidated toward my plasma cannon Armored Sentinel and one of my lascannon Armored Sentinels respectively. So my opponent finally managed to kill 2 infantry squads and 1 Leman Russ Annihilator. Hooray for him. I had both my Armored Sentinels fall back, and then Deep Struck my Tempestus squads with 2 plasma guns behind the Longfangs. The rest just Deep Struck in front, with the 2 plasma Tempestus command squads appearing in front of the Wulfen and the final command squad and the melta Scions jumping in front of the Terminators/Wolf Guard. The Tech-priest Enginseer continued to repair my Leman Russ Executioner and brought him back to 10 wounds. In the shooting phase, I proceeded to destroy everything. My heavy weapons squad dealt 5 damage to the Land Raider Crusader, and his last wound was removed by my third lascannon Armored Sentinel who was the only Armored Sentinel not locked in combat. Never underestimate Armored Sentinels! 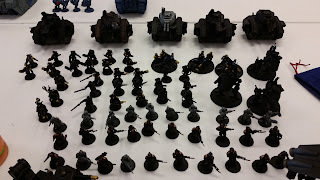 Not only did they divert a lot of firepower away from my tanks and infantry (and survived, to boot), they also prevented the Terminators and Wulfen from consolidating into my more important units such as Kastelan robots and Leman Russ tanks in melee. This is why you field them! They are extremely important and useful so don't dismiss them and call them trash units or useless - in the hands of a good commander, they can turn the tide of battle. Anyway, both Tempestus squads with 2 plasma guns each fired and wiped out the Longfangs. On the other end of the table, the first Skitarii Vanguard with plasma calivers, the 2 Tempestus command squads with plasma guns, and 2 of my Leman Russ Executioner tanks fired and wiped out the Wulfen. Wow, those bastards really take a lot of firepower to kill. I know I had a couple of plasma cannon sponsons fire on the Intercessors, but they made their 6+ armor saves. Damn it. So the Intercessor squad still had 4 guys left apparently, but at least the Wulfen were dead. Meanwhile the Skitarii Rangers with transuranic arquebuses fired on Logan and they rolled double 6s for wound rolls, dealing 2 mortal wounds straight, and another 5 damage when he failed his armor or invulnerable saves. Despite his Tenacious Survivor Warlord Trait, he didn't get a single Feel No Pain roll off and he died. Slay the Warlord! And death to the traitor Logan! Meanwhile, my Guardsmen and plasma Tempestus command squad killed a squad of Inceptors. The Leman Russ Executioner then wiped out the 2nd Inceptor squad with a barrage of plasma. My Leman Russ Annihilator fired on the Thunderwolf Cavalry and killed 2 of them while putting a wound on the last one (probably rolled a one for a lascannon shot or something). My 2nd Skitarii Vanguard squad with 2 plasma calivers and the melta scions fired, but the Wolf Guard saved everything with their storm shields' 3++ invulnerable saves. Then my Kastelan robots fired, and I used the Wrath of Mars Stratagem. Between mortal wounds and unsaved wounds, I killed almost the entire Wolf Guard squad except 2 Terminators, one of whom had one wound left. Desperate, I had my Tech-priest Dominus fire his Volkite blaster in hopes of rolling a 6 to deal a mortal wound, but alas, it was not to be. Funnily enough, my opponent rolled a one for his save and the wounded Terminator died. Only one Wolf Guard was left, standing in front of my Kastelan robots, Armored Sentinel, Tech-priest Dominus, Company Commander and 2 Leman Russ tanks. That was it for my turn. I left it to my opponent, but he called it game. He only had one Terminator, Lukas, the Iron Priest, the Wolf Priest, one Thunderwolf Cavalry and 4 Intercessors left on the table. 9 models, to be exact. Whereas I only lost 2 infantry squads and 1 Leman Russ Annihilator and had almost my entire army on my table. Never mind my infantry (all my Tempestus Scions and Skitarii were still alive), I still had 4 Leman Russ tanks and 3 Armored Sentinels left on the table. It would be very difficult for him to do anything to me and I was in good position to table him the next turn with all the firepower I had at my disposal. Oh, wow...I absolutely destroyed his army, even the Sicarian Battle Tank he was looking forward to playing. That's...a little sad for him. But he did make several weird decisions, like shooting my Armored Sentinel or tanks with anti-infantry weapons. Why did his Inceptors shoot their assault bolters at my Leman Russ tank? Why did his Sicarian battle tank fire its main weapon at my Leman Russ Annihilator instead of my infantry? That was just plain weird. On a side note, his units were absolutely brutal in melee - they tore my poor Guardsmen apart. Ouch. 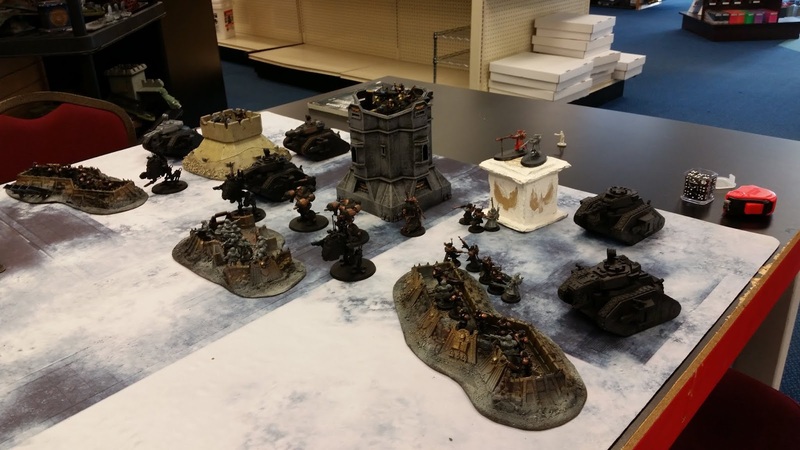 The Draconian Armored Defenders and Draconian Skitarii come under attack by Khornate Space Wolves (or whatever Traitor Heretics that use Space Wolves rules). Well, he asked for a rematch tomorrow, and it seems that it'll be a 3,000-point game. I'm tempted to bring Imperial Knights (I know he's bringing his Knights), but I might just go the Shadowsword route instead. We'll see. Anyway, we destroyed the Khorne heretic Space Wolves with our faith in the Emperor! Trooper Matsuda raised his head, puzzled, as the heretic Astartes withdrew. There was howling, but whether it was from rage or despair, he couldn't tell. "Easy for you to say," Umezu growled beside him, lowering his smoking lasgun. "Didn't you see Kurosawa's squad? They were torn apart by those monsters." Mastuda gulped at that, remembering the gruesome scene when those mutants in power armor lunged forward and ripped Kurosawa's squad apart. The Emperor's Vengeance had fired its Executioner plasma cannon in retaliation and vaporized the howling mutants, but there was no one to save by then...both loyalists and heretics melted togethering into a fuming puddle. There was still a single Chaos Terminator bludgeoning through the Draconians' lines in the center, but Matsuda was happy to leave it to the Skitarii stationed there. 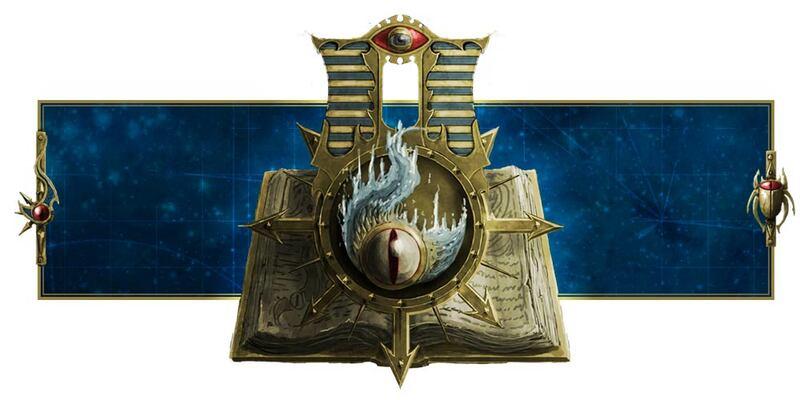 Magos Mecharius Sigma could take care of him, especially with a cohort of Kastelan robots at his back and 2 squads of Skitarii Vanguard armed with plasma calivers. That left a single Daemon in front, but the foul creature had turned tail and fled after Solar Burst had fired its twin and hull lascannons and extinguished two of its comrades. Matsuda was grateful for the Leman Russ Annihilator and its brother Executioner tank, Macharius Shining, for watching their backs. Otherwise his squad would have ended up like the other two, torn apart by armored monsters and mutants. "For heretic Astartes, they were pretty...ineffective," Matsuda observed. "I was expecting more..."
"We lost Holy Beacon and 2 entire squads," Umezu reprimanded him. Matsuda nodded. "Exactly, Yet we wiped out 5 squads of Heretic Astartes, 2 Daemons, a pack of mutants, and almost an entire squad of Terminators, plus 2 heavy tanks. Oh, and the heavy weapons Marine squad at the back. That's quite a low tally of casualties on our side, considering the enemy." "The Emperor protects," Umezu snapped. "These Traitors turned their backs on the Emperor. Of course they wouldn't receive the same divine protection we would." Matsuda gave up arguing with him and turned his attention back to the fleeing heretics. The Traitors would be back, he just knew it.